Last summer I worked with Orlo Schroyer in developing summer school using the Newton Company. Orlo is a fabulous man to work with and since he lives in the same town as me, he invited Bob and me to come to his house to enjoy a sip of wine and some cheese. We have a lot in common with the Schroyer family but one of the top five was books. 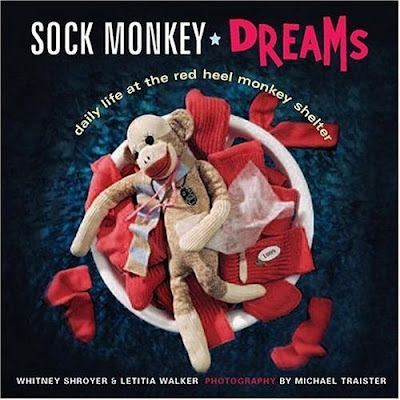 I was thrilled to learn that Orlo's son Whitney had cowritten a book with his wife called Sock Monkey Dreams. Inside cover: In celebration of an enduring American craft icon, Sock Monkey Dreams dares to ask the question, "Just what are sock monkeys up to when humans aren't looking?" Since the early part of the 20th century, sock monkeys have inhabited our homes, schoolyards, and lives. Now, Sock Monkey Dreams reveals their secret lives in perhaps the most compelling and detailed expose ever published. Written by those who know it best, the monkeys themselves, a peculiar world emerges, alternatively funny, sweet, clever, crabby, and more than a little tongue in cheek. Newsmonkey Benny Hathaway and socktographer Link Ray chronicle the daily life at the Red Heel Monkey Shelter, a home for abandoned sock monkeys. Through their careful reportage, a distinct society comes to life. Elaborate full page dioramas and stories lie at the heart of the book while sidebars, footnotes and fun facts throughout fill in the gaps of sock monkey cosmology. Between the covers of Sock Monkey Dreams you will meet Reggie and Loretta, the peoples who run the shelter and rescue monkeys who are "for sale", learn about the evolutionary development of sock-kind from Folio, the resident scholar, watch Happy George host his late night talk show, learn why the Bed Monkey has the most status in sockciety, witness the results of the "who Wants to Marry Mollie Haversham" contest, and so much more! The Red Heel citizens act out such familiar concerns as education, entertainment, religion, love and commerce, exuding simple charm and a reflection of our own humanity. Rich in imagination and broad in scope, Sock Monkey Dreams digs deep into the history, lore, quirks, and foibles of a simple species with a big red mouth. I think I loved this book so much because my Grandmother Oliver always made me a sock monkey for Christmas. I think that I kept getting one for Christmas because I would wear the previous one out. I stopped getting them when I was around 10, and I never understood exactly why, but was at an age where I was afraid to ask. This book tells about the history of sock monkeys while telling a fictious tale. Various styles are described while intertwining about the stories of their lives. I felt like I was looking through a window of a doll house! Each chapter is a little vignette into the life of sock monkeys and can stand alone as a short story. It is clever, imaginable and fun. If you have any history at all with a sock monkey, I believe you will enjoy this book! Thanks for sharing such a unique book. Years ago, I found a sock monkey Christmas ornament that reminded me of one I had as a kid. It looks like a fun and colorful book. Is it available in all of the usual places? Amazon, Borders? Yes, Becky, I found it on Amazon. Does every family have a sock monkey lover? I have a niece who collects them so this sounds like a good gift for her birthday. Thanks for the review! Terri, I made a sock monkey quilt for a friend's son last year. It was a blast. There is a woman in Wisconsin that has a fabulous line of sock monkey greeting cards...I love giving these cards. I bought three that I am going to frame. I will have to share them on my blog some day soon. Check out her website: http://sockmonkeylady.com. What a clever idea. I'll have to check into this one. Terri, this is one of the many reasons I just adore you. Your interests are so wide and varied! This sounds so interesting...I never knew. I never had a sock monkey but this makes me want to get one now! What a great book! I love sock monkeys! Wonderful review, Terri. My girls had homemade sock monkeys. Now they're sold at Target. I wonder if they were always available in stores. I'd love to hear about some of your favorite B&B's at Hermann. Terrie and Steve are going over there soon. They're staying at the one that is in a newer house, I think. I hope your Quail turn out well. Just watch them close. Some of mine were cooked a little too long. But in all were very good. My mama tells us she never tasted beef until she married my father. That is unreal to me. I grew up on beef, of course daddy raised cattle and chickens, so we never lacked for meat. I did not taste a pizza until I was 13, my kids cant beleive that! I have to confess that sock monkeys have always creeped me out! To this day I just don't like them!